Bakers in the north and north-east been declared among the best purveyors of savoury snacks in all of Scotland. The World Championship Scotch Pie Awards were announced yesterday, with prizes being dished out to the makers of all manner of popular pastry products. Judges decided that Chalmers, which is based in the Bucksburn area of Aberdeen, makes the best item involving haggis after sampling its beef and haggis pie. Company director, Pamela Chalmers, said: “This is a huge honour and we are proud to take our trophy home to share with our team and our customers. Meanwhile, the Nevis Bakery in Fort William won the award for the best bridie. Archie Paterson established the shop in 1980 and it is still run as a family business, with his son and daughter taking leading roles in the company. Mr Paterson said he was “delighted” with the award. More than 450 products were entered by more than 80 butchers and bakers during the 20th instalment of the awards. The tasty treats were judged by a panel of 50 industry experts and professionals, with the winners were announced during a ceremony in Cumbernauld. The top prize, for best Scotch pie, went to The Little Bakery in Dumfries. The 75-year-old owner of the business, Kerr Little, said the victory was “something that we never imagined”. Brownings the Baker, of Kilmarnock, won the prize for the best football pie, while Chapman Butchers of Wishaw were rewarded for making the best steak pie. 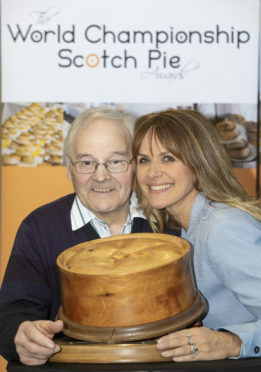 TV presenter Carol Smillie presented the awards and commended the succulent efforts put forth by firms across the nation. Head judge, Ian Nelson, added: “The competition aims to highlight that bakers and butchers create high quality pastry products day-in, day-out.